Ideal for entryways of all kinds, hallways, staircases, driveways, warehouse and office areas, airports and train stations. The Medusa is a battery-powered machine developed specifically with professional users in mind. It has a working width of 37 cm, including its two inwards-rotating side brushes. Objects with a diameter of up to 2 cm can be easily vacuumed during operation. With its light weight and compact dimensions, the Medusa is designed for hard-to-reach spaces. The side brushes enable a complete and thorough cleaning along edges and even in the smallest corners. The powerful Lithium-Ion battery (without memory effect) with 10.8 V and 1.5 Ah allows an operation time of approx. 45 minutes per battery. A second, optional battery can be directly stored and carried on the machine itself. Quick-charging unit with a charging time of only 70 minutes is included with purchase. Compact Wet/Dry vacuum cleaner with durable stainless steel body and a 28 litres container volume. 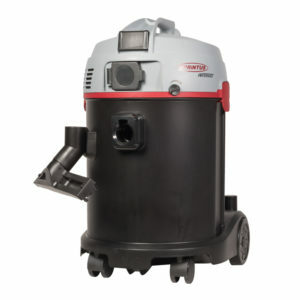 Especially designed for facilities, industrial and workshop environments, and for any situation that requires a robust, reliable and long-lasting vacuum. With its incredible suction power and robust design, the N28/1 E is best equipped for hard, daily use. Its stainless steel container is attached to an undercarriage made of impactresistant plastic. The large wheel base and 50 mm swivel casters ensure optimal stability and prevent tipping. Wet and dry vacuum cleaner, 2 individually adjustable turbines, 55 litres container volume. High-performance vacuum for maintenance, facilities services and the food service industry. 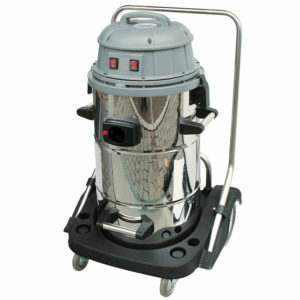 Especially robust stainless steel wet and dry vacuum cleaner for heavy daily use. Through the use of the fine dust filter cartridge, the fleece filter basket, and the included wet- and dry-surface accessory nozzles, an impressive area output is reached. With two individually adjustable turbines and their large power reserves, the vacuum is capable of the appropriate suction power for every situation. The convenient container tilting function enables fast and handy emptying. The sturdy chassis with metal casters and large rubber-coated wheels ensures problem-free working, even on sensitive surfaces. Also available is an optional 650 mm gangway nozzle for wet surfaces, which can be mounted on the undercarriage of the N 55/2 E and operated from the backside of the device. 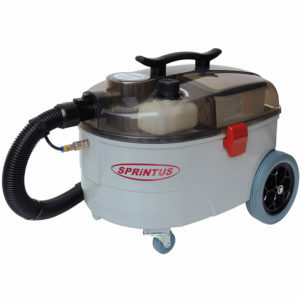 Stainless steel wet and dry vacuum cleaner, 3 adjustable turbines, 77 litres container volume. High-performance vacuum for maintenance, facilities services and the food service industry. The professional vacuum with a fine dust filter cartridge, fleece filter basket, and complete accessories. Extremely high performance and easily adaptable due to its three individually adjustable turbines. 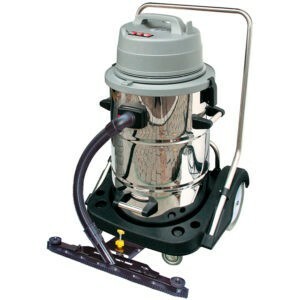 The N 77/3 E is an especially robust stainless steel wet- and dry-surface vacuum cleaner and was conceptualized for excessive use. The convenient container tilting function enables fast and handy emptying. The sturdy undercarriage with metal casters and large rubber-coated wheels ensures problem-free work, even on sensitive surfaces. Also available is an optional 650 mm gangway nozzle for wet surfaces, which can be mounted on the undercarriage of the N 77/3 E and operated from the backside of the device. Grand class at a low price. 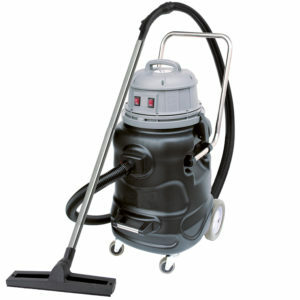 Very durable all-purpose vacuum with container volume of 80 litres. Wet/Dry Vacuum Cleaner with outstanding price to performance ratio. The N 80/2 K is equipped with a fine dust filter cartridge, fleece filter basket and complete accessories. Its integrated waste water drainage hose makes it especially suitable for frequent use on wet and large surfaces. Two separately operable turbines create power reserves and make the vacuum adaptable to each individual implementation. With its particularly durable plastic container, robust carriage with metal casters, and large, rubber-coated wheels, the N 80/2 K is optimally equipped for daily, hard use. Its extensive accessories can be stored ergonomically on the back of the device. High-performance pump vacuum with an extremely high flow volume. Pumping out water after floods or water main breaks, washing flat roofs, pond or pool sanitation, and other cleaning duties. The N 51/1 KPS, with its 50 litres container volume, is ideal for tough, professional use. The integrated pump with a flow volume of up to 14,000 litres per hour can be directly attached to the vacuum’s power socket. A filter net prevents leaves, wood, and smaller objects from entering the container and prevents blockages. The filter net can be conveniently emptied via the robust zipper. Wastewater is continually drained from the container through the provided 10 m wastewater hose. The C-pipe connection of the wastewater hose is a standardized size that also fits fire department and technical emergency service (THW) hoses. The N 51/1 KPS can also be used as a normal vacuum cleaner and achieves a suction power of 230 mbar. Spray-extraction cleaner with a separate anti-foaming tank. 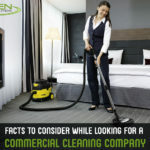 Designed for rug, carpet, and upholstery cleaning in offices, clinics, cinemas and households, as well as car upholstery. 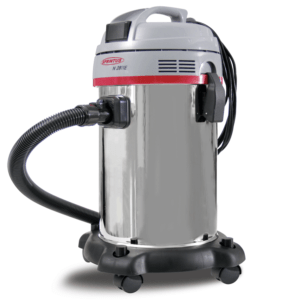 With 4 bar spraying pressure and 230 mbar suction pressure, the SE 7 cleans quickly and thoroughly. The spray function can be turned on or off with the valve lever near the handle. The liquid levels of both the 6.5 litres fresh- and wastewater tanks can be checked at any time through the transparent lid of the device. Both tanks are separately removable. A third, integrated container allows the use of anti-foaming agent. The clear upholstery and floor nozzle allows free sight of the surface being cleaned and constant control over the process. Its ergonomic form guarantees effortless work. The 7.5 m power cord ensures a large working range and can be rolled up on the cleaner handle after use. 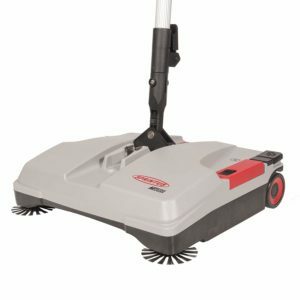 The body of the cleaner is made of impact-resistant plastic and is equipped with large, rubber-coated wheels, which leave no traces even on all sensitive surfaces. 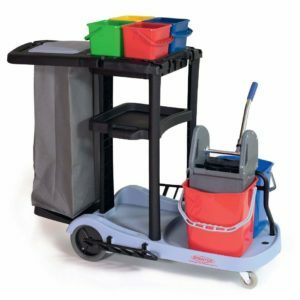 Sprintus – Cleaning cart Colour separate mop pail, bracket for hamper bin bag. Suitable for Hallway, house and bathroom cleaning in public institutions, hotels, guesthouses,, hospitals and the elderly care. Handy eccentric single disc machine. Bathrooms, baths, changing rooms, stairs, hard surfaces and carpeting. The EEM 13 R eccentric dingle disk machine is ideal for cleaning small surfaces, niches and corners due to its compact construction and simple operation. With its nominal weight of 12.7 kg, it is also suited for use on staircases. The eccentric transmission ensures effective cleaning and problemfree, safe maneuvering without effort or strain. 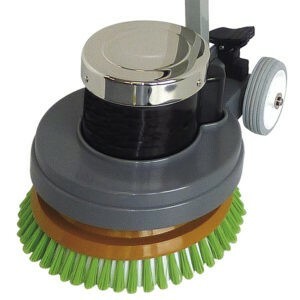 The large rubber-coated wheels allow for convenient transport without leaving traces on the freshly-cleaned surface. 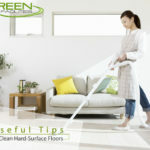 One can clean hard surfaces, buff stone and parquet flooring, and even shampoo carpeting with the included accessories. Quiet and powerful Wet/Dry vacuum cleaner with 30 litres container volume. 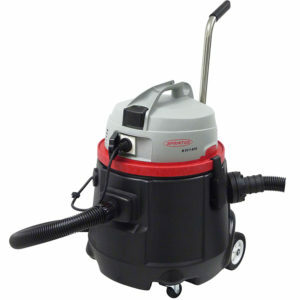 The ideal vacuum for facility cleaners. Outstanding performance and thorough cleaning. 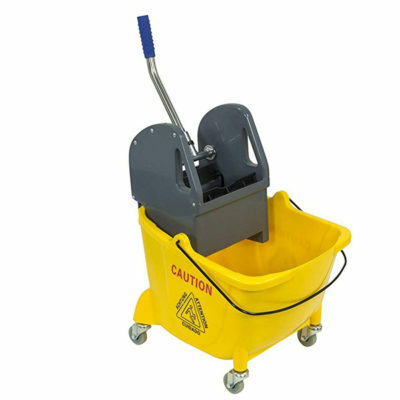 Of the 30 litres-class vacuums, the “Waterking” is the bestsuited for cleaning facilities. Extremely high performance (260 mbar suction power at 70 L/Sec). Used in combination with the 360 mm wide floor nozzle, the “Waterking” displays outstanding performance on a range of surfaces. Thanks to the mechanical output regulator, suction power can be adapted to any kind of flooring. With the integrated blower function, filters and work benches can be blown clean, or wet surfaces can be blown dry. On-device storage for the hose, power cord and accessories, as well as a parking position for the tube and an ergonomic handle, ensure optimal handling and make the “Waterking” fit for professional use. A high-performance power socket located on the head allows for the use of further cleaning machines directly through the vacuum.